Use practical exercises to reinforce your understanding of facility-based ICD-10-CM and ICD-10-PCS coding! 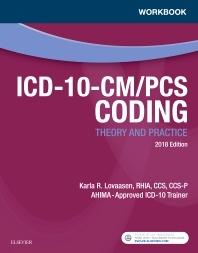 Corresponding to the chapters in Lovaasen’s ICD-10-CM/PCS Coding: Theory and Practice, 2018 Edition, this workbook lets you apply your coding knowledge to realistic medical records. This edition reflects the latest updates to ICD-10 and includes updates and new content to ensure you learn the most up-to-date coding information. Plus, hundreds of engaging, interactive exercises help you review concepts, develop skills, and prepare for successful employment as a medical coder. Hands-on activities and case studies help you master coding concepts and apply them to actual health records and real-world scenarios. ICD-10 Official Guidelines for Coding and Reporting provided in each coding chapter to enhance your understanding of how to code accurately.